There are some pretty interesting fictional cocktails out their in media land. I vow to try each and every one of them eventually. Here’s what made it to the top of the wishlist! When Homer Simpson is stuck at home with his terrible step-sisters and not a drop of beer to be found, he panics and puts together a cocktail made of all the booze he has left, accidentally adding some children’s cough medicine to the mix. Ash from one of his step-sister’s cigarettes lights the concoction on fire and makes it taste amazing. When Homer shares the recipe with bartender Moe Szyslak, Moe steals the drink and markets it as a Flaming Moe, gaining fame and fortune until Homer reveals the secret ingredient as revenge. 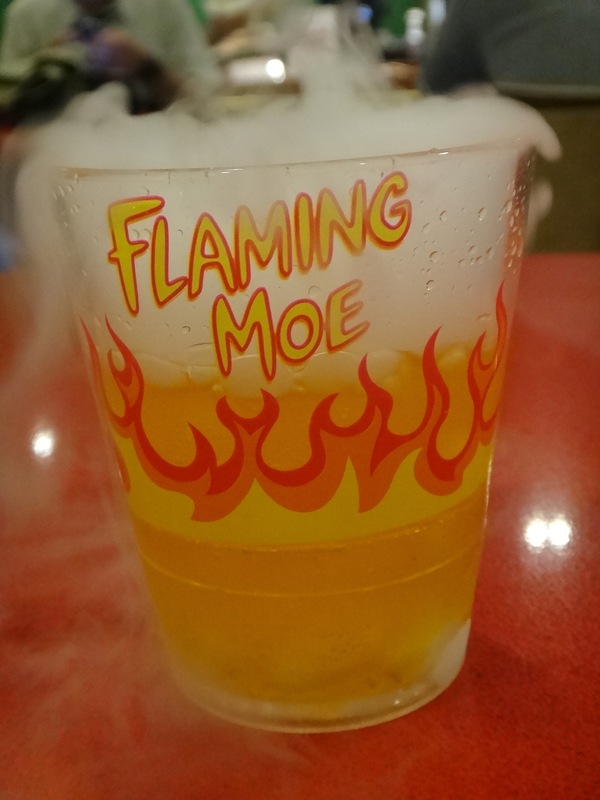 The Flaming Moe is actually served at Universal Studios: Florida… another reason to go back to that amazing park! When Cheers has one bartender too many, the regulars want to keep Woody Boyd on the job over newcomer Wayne. When Wayne bets his job against being able to make any drink ordered, the Cheers gang makes up this cocktail on the fly in order to throw Wayne off. Of course, it’s pretty hard to replicate a recipe that doesn’t exist. 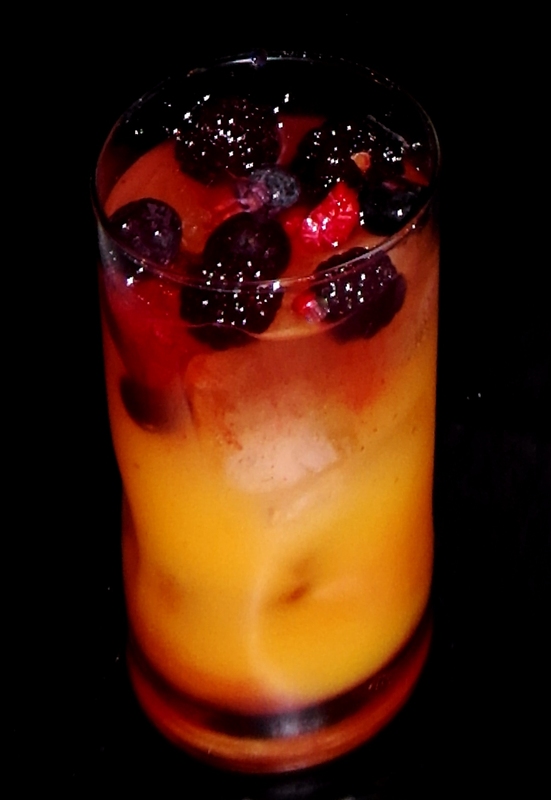 The drink has since been produced by a couple of bars with varying recipes. Unless it’s served while you’re saddled up between Norm Peterson and Cliff Clavin, it just wouldn’t feel right. Invented by Zaphod Beeblebrox, the drink is described as “the alcoholic equivalent of a mugging – expensive and bad for the head” and it “is like having your brain smashed out by a slice of lemon wrapped round a large gold brick”. The drink has been created in reality for stage productions of The Hitchhiker’s Guide to the Galaxy and at bars around the world. Suggested recipes I was able to find largely just throw a ton of different boozes into the mix. Absinthe and milk… a winning combination? Just think about it, you get your daily calcium nourishment, as well as an elixir meant to make you trip balls. This potent cocktail is the invention of Pam Poovey, director of human resources at the ISIS spy agency. Pam can often be seen walking around bars with her own personal booze chilling units, so it’s no surprise she is a liquor hound. She will even pour absinthe directly into a carton of milk! 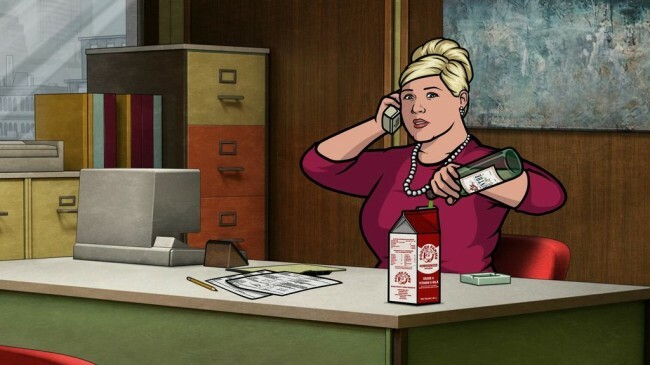 There are other Green Russian recipes available online, but I think Pam was on the right track with her rendition. Francine Smith was once a hard-partying girl along with her partner in crime Kelly Wilk. When Kelly comes back into Francine’s life, the two try to recreate their wild times, with Haley Smith insisting she can keep up with the women. Haley drinks the fabled Kidney Killer and winds up in need of a kidney that Francine can’t offer, herself a victim of the booze. There is a Kidney Killer recipe on the internet. It combines tequila and Southern Comfort into a shot glass. The jury’s out as to how many you need to drink to actually kill your kidney! This martini of vodka, cranberry juice and a bouillion cube is perfect for celebrating the Thanksgiving holiday. It’s like having a home-cooked family meal in a cocktail glass. Inventor Barney Stinson has provided me with the perfect libation for upcoming Thanksgiving celebrations. All that’s missing is the turkey, potatoes and stuffing, but I’m working on it. Stinson also has drink suggestions for Christmas, Arbor Day, Independence Day, and Ramadan! Look forward to future posts about fictional companies, restaurants, sports teams, sodas, and just about anything else this old, battered mind can think up! Sadly, the tonic didn’t send Mrs. Sip and myself into the throes of passion (as it worked in the cartoon… let down by TV once again!). Despite that small discrepancy, this drink was pretty good. All the citrus and berry notes were very enjoyable and the liquors did their jobs, as well. This entry was posted in Crazy & Classic Cocktails and tagged American Dad, Archer, Barney Stinson, Blueberries, Cheers, cocktail, Flaming Homer, Flaming Moe, Green Russian, grenadine, How I Met Your Mother, Kidney Killer, orange juice, Pam Poovey, Pan Galactic Gargle Blaster, Screaming Viking, Simpson & Son Revitalizing Tonic, Smirnoff Blueberry Vodka, Southern Comfort, Sweet & Sour Mix, Thankstini, The Hitchhikers Guide to the Galaxy, The Simpsons by Daniel Wilson. Bookmark the permalink.